The most outgoing Google co-founder, Sergey Brin, launched a personal blog at too.blogspot.com. "While Google is a play on googol, too is a play on the much smaller number - two. It also means in addition, as this blog reflects my life outside of work," explains Sergey Brin. The first blog post is somber: Sergey discovered that he has a "higher chance of developing Parkinson's in [his] lifetime than the average person". So, when my wife asked me to look up G2019S in my raw data (23andMe scientists had had the forethought to include it on their chip), I viewed it mostly as entertainment. But, of course, I learned something very important to me -- I carry the G2019S mutation and when my mother checked her account, she saw she carries it too. The exact implications of this are not entirely clear. Early studies tend to have small samples with various selection biases. Nonetheless it is clear that I have a markedly higher chance of developing Parkinson's in my lifetime than the average person. In fact, it is somewhere between 20% to 80% depending on the study and how you measure. Sergeys blog shows that 23andME incentive to 'democratize personal gentics' can be a mixed blessing for those having their DNA screened. Is Sergey better off knowing he has a large chance at getting Parkinson's? Because knowing there is a chance can be a burden in itself. Would you feel better off knowing you have a chance at a number of genetically determinable diseases - which not all may be treatable? Doesn't the saying apply: 'ignorance is bliss'? 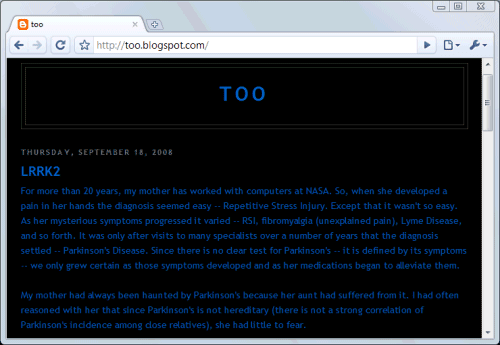 There is a lot of research on Parkinson's disease, some fairly encouraging. One advantage to Sergey's knowing is that he is in a position to fund such research. Maybe the Google $$$ will benefit him in ways he never expected. Good luck to him. Good on him. My grandfather had this disease, so any awareness that can help progress is a good thing. yes Good luck to him. Unfortunately, Sergey Brin's blog does not have an option to reply or write him a message. I've could tell him how to live longer and avoid the disease he has, or perhaps give an advice, or someone else could, but he might think that he knows everything by himself already and does not need more info on this subject. So, what's the purpose to spread a word about your health without having a friendly conversation? Anyway, check how АСД-2 can help you. How much should you worry about this though? I guess it depends on your age. Who knows, by the time you reach the age where Parkinsons becomes a real issue, they might already have a cure! Fingers crossed. I have read numerous articles about your being a carrier for gene LRRK2 which potentially puts you at a theoretically higher risk of developing Parkinson's disease. Given this situation, you determined to put your communication and financial means to good use in an attempt to find a cure for a disease you may actually never get. This approach, which is both preventive and active, denotes your lucidity and refusal to become a victim of a neurological degenerative affliction. I am writing today to give you the opportunity to become involved in developing a combined therapy to treat Parkinson's disease, without precluding other research routes, and also take part in the development of a therapy to treat numerous other afflictions of the spinal cord, including paraplegia and quadriplegia. I am a member of Neurogel en Marche Association, an association of paralyzed people who, just like you, have decided to take charge of their future and have managed to secure the patent for a therapeutic tool called Neurogel. Neurogel is a bioadhesive three-dimensional hydrogel, which is biocompatible with the brain. Our Association has a scientific council made up of international noted scientists and is prepared to conduct clinical trials on humans within a short time, through different approaches and techniques. Professor Alfredo Gorio, from the University of Milan, member of our scientific council, would like to conduct a study in which Neurogel would be implanted in the brain, at the level of the necrosis. As a result of the gel's tissular intergration, he could use this drug reservoir for all the molecules currently acitve and whatever the stage of Parkinson's disease. Pr. Gorio's work goes even further. He has isolated a certain type of stem cells from the amniotic liquid, and was able to modify these cells and clone them into nerve stem cells which have extremely high resistance and life capacities, even in poorly vascularized environments. Although Pr. Gorio is also working on other studies to use Neurogel and his new line of stem cells within the framework of lesions of the spinal cord, he is prepared to meet with you to present and explain the pre-clinical he would like to conduct. I hope to have the honor of putting you in touch with Professor Gorio as soon as possible and to give you the opportunity to be part of a global venture to treat invalidating affections of the CNS. my name is Alexander Cherkasky, I am inventor and biologist. 1. I propose the joint creation of The Google Institute for Realization of Inventions, preferably of Biomedical Inventions, independently from status of inventors. My proposed Inventions Implementation System can allow dynamic and very efficient solving of problems of people, especially can allow very efficient and very dynamic implementation of inventions for regeneration as well as inventions for combating viruses, autoimmune diseases and cancer. The proposed Institute can be considered as a complementary system to companies and academic research organizations and can cooperate with them. This structure will be the new system, the third column of economy, in addition to academic research institutes and companies, because researchers at institutes and companies are generally staff members who are focused on their own projects. There is a paradox, because for example people need to combat viruses, such as HIV, and on the one side billions are donated to combat viruses, on the other side, inventions, especially my inventions, exist in order to combat viruses both in and outside of cells and these my antiviral inventions are published as patent documents, but people do not get these inventions, although people need these inventions. In the first stage the Institute will be the organization offering an internet site for presentation and open evaluation of grouped inventions, especially concepts or key inventions for combating diseases, as well as for regeneration and rejuvenation. Thus people will get a new based hope, because they will see transparently, openly the possibilities of healing. These are possibilities for patients to know and realize therapeutical inventions and these inventions could be applied for Compassionate Use. Thus it will be possible to bring together entrepreneurs and investors, inventors, other experts, patients and biotech service companies, who will be interested to get orders for open transparent realization of selected inventions. Donations can be used also for ordering biotech service companies to realize the selected inventions. The second stage can be establishing the Institute's own labs. The proposed Institute can work also as a company. I was born 1981 in Zaporozhye, Ukraine, living since 1996 in Dusseldorf, Germany, have finished Goethe-Gymnasium and Heinrich-Heine-University in Dusseldorf, my inventions include causal therapeutic solutions for combating cancer, viruses (both in and outside of cells), autoimmune and immune complex diseases, inventions for rejuvenation and tissue regeneration, inventions of novel multi-parallel diagnostic and gene sequencing systems, new materials and high-quality synthetic diamonds, and I have German patents and published American, international and German patent applications claiming priority and novelty worldwide. Known media including Stern (The Star) wrote about me and I got bronze medal “For Outstanding Achievements” and the Honorary Certificate at the (largest in Germany) inventors competition IENA (Ideas-Inventions-New Products) 2003 in Nuremberg. In addition, I offer innovative solving of scientific and technological problems in biomedicine, biotechnology and material science, and for creating and improvement of intellectual property in these fields. My patent documents were referenced in more than 25 patents of companies, universities and research institutes in 10 countries, in The USA, Canada, Spain, France, UK, Japan, China, Switzerland, Belgium and Germany. I will be glad and grateful to get your positive and soon response.